During the last years I have created a number of tools to simulate and visualize mathematical models and algorithms. Here I present some visualizations in the hope that they will be useful for presentations and publications, as well as just for the pleasure of seeing these evolution of processes, that so many researcher work so hard to understand. All media provided below can be used for educational and scientific use with proper attribution. Let us start with some interactive demonstrations I created for the Network Pages. A complete list can be found here. An animation that shows the creation of an Erdös-Rényi Graph. The parameters of the model are expected as input. Click on the picture to open the animation in full screen. An animation that shows how a graph is created according to the configuration model. In this example the degrees are choose to uniformly from a interval. Click on the picture to open the animation in full screen. This shows how the Dijkstra algorithm works. 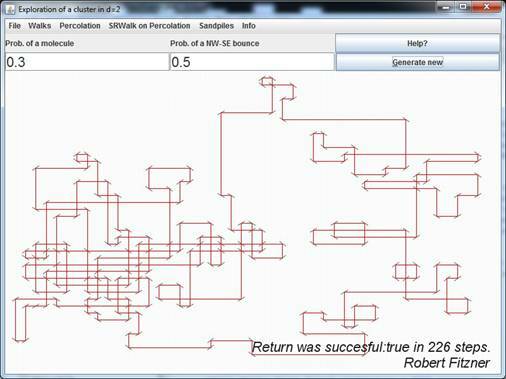 This algorithm is used to compute the shortest way between location. As example we use the streets of the Dutch town Brielle. An explanation of the algorithm can be found here. A simulation of an ideal gas, confined in a box with reflecting boundary. During my PhD I create an program to generation realizations of the models that I encounter. I invite everyone to use this program to generate pictures and animations to be used within teaching/research. The following link opens the applet in a new window. It requires java to be installed (available at java.com): Applet. (VERSION 7-10-2012). The source code of the file is avaiable on my GitHub page github.com/rfitzner/. Further, you can download the program as an executable file as jar and as exe. To run the .jar file you will also need to have java on your system. The .exe file is able to run on windows systems that do not have java installed. Below you can find a small overview of the models that have been implemented. I would be thankful if you report any bugs to me. Percolation on the two dimension lattice. You can observe the evolution of the system, by increasing the probability of keeping an edge step by step. A function to exports the simulation into pictures is integrated. Implementation of a discrete Lattice gas model. This simulates the follow photons through a gas. Photons are flight through space and bounce of atoms/molecules. For mathematicians a major question is whether the photons will return to its original position.